Preparing for School… Se7en Tips for a year with Sonlight. So our books are on the way and we are a week or two from starting a new school year. I am starting to get back into our school gear, and the one thing many people ask is how do we do more than one Sonlight Core at a time. The simple answer is: it isn’t my school it’s my kids school – they are doing their own Cores! But I realize that you want to know more. So I thought I would write a couple of posts on how we do school. And this is the first one on preparation. Before I get going I need to say I unashamedly use Sonlight, love Sonlight and advocate Sonlight. We do other stuff, journals and whatnot that any homeschooler can appreciate but our schedule and our books are all thanks to Sonlight. By way of introduction I need to say that the year before we started homeschooling I started reading absolutely everything I could lay my hands on about homeschooling and visiting everyone I knew who was already homeschooling. I went to every talk, every presentation… every everything. And it really was quite easy to choose how we would go about it: Someone lent me a Sonlight catalogue and I found all those books I wanted to reread from my childhood. So in the name of providing my children with a cultural heritage by providing heaps of brilliant books I have learnt so much wonderful history that I never knew before and I have read brilliant books we have all totally loved. Folk have said to me they wouldn’t use Sonlight because you have to read so much – I love reading to my kids and at least I know where there are! Folk have said to me it’s not hands-on enough. It is as hands-on as you make it. The information is there in the books if you choose, for example, to make an igloo out of sugar cubes that option is yours, but not prescribed. Folk have said to me it costs too much – compared to what? Everything comes in a box. I don’t have to spend hours sourcing it. I don’t spend my time researching for the best stuff… its in my box already. I don’t spend hours plotting and planning a schedule, that would be in my files. Anybody knows time is money and the amount of time Sonlight saves me is really priceless. But I digress… Let’s get back to preparation! One thing about Sonlight is that you have to read the catalogue and you have to read it thoroughly. You cannot sit down at the computer and say Right, now I am going to order school books for the next year. No, that will end in tears! You need to plot and plan which Core/Grade you are doing and which bits and bobs you will need to add in. Each year we buy the next core up and any consumable books for the previous cores that we will be using. 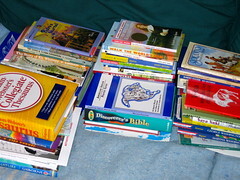 Except this year I have forgotten to buy the grade 4 Bible books – I forgot they were consumable. So when our books arrive next week I am going to really, really kick myself! – and then rethink. Box day!!! And I have a plan. Everything is unpacked into piles science, history etc. 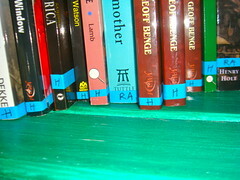 The little stickers are popped on the back and the books labeled – before anyone may touch them and they get lost in the melee of other books floating around the house. Once that’s done I move onto the dreaded files. I hate organizing them but I love it when it’s done! 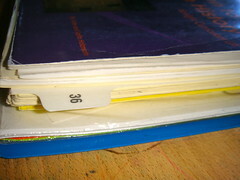 Each grade has a large file – that is sorted week by week. I organize all the files and collate pages as soon as our boxes arrive and wouldn’t dream of starting school before our files were in order! I take about a day to organize each file because at the same time I am scanning the content and mulling over ideas from other resources and letting projects spin around my head. I would hate to arrive on a Monday morning and discover we were doing a specific topic and I hadn’t gathered all my resources (apart from school books) together. How do I sort the files: The history, read-aloud, reader and science schedules are sorted week by week and any relevant notes for readers and such-like are popped into the week that they come up for the first time in the schedule. Each student has their own smaller file, which contains their language art sheets, their science sheets and I wish their history sheets (I know not very Charlotte Mason – but something I have often wished for anyway). Also anything else that is relevant to their school year, for example in Grade 5: Their round-the-world trip goes in there too. At the front of each of these files are the schedules for the week ahead. At the end of the week I swap out that weeks schedule with the schedule for the next week ahead. Each week they have their file good to go. As I prepare for the week ahead: I make a pile of books for each grade and as we move up a grade I mark-up the books to read in the next week. So all our books are marked up until grade 5 and this year as we march along I will mark up grade 6 books – with the schedule popped into the book at the top of the page: For example: Week 15, Day 3 (the next 4 pages). I find my kids don’t really follow the schedule pages well they need it written in the book as a reminder. At the end of each week I glance at the schedule and swap out the books that are finished and replace them with any new books they need. Each week they have a pile of books good to go. 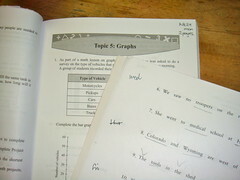 They have two types of workbooks, Math workbooks and Grammar/Vocabularly workbooks. On a Friday I mark the pages up for the week to come – no one ever needs to say I didn’t do my math because they didn’t know what to do. I never have to mark books because if they have a problem as they work then they ask me. And if they don’t ask me I assume it’s done – if it isn’t then I will discover it when I mark up at the end of the week and there is always Saturday morning to catch up (just the horrific threat is enough to keep the work done!). 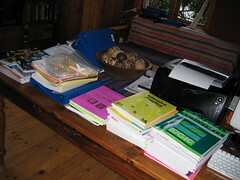 Each week they have a pile of workbooks good to go. Everyone has a main journal: For Bible Study Notes, creative writing, mini-projects and book reviews. Then they have a History Journal and Science NoteBooks. They also have Math Notebooks but we won’t talk about those! This preparation is my favorite part and the most time consuming… Each weekend I look at the schedule for the week ahead and get an idea for what each kid will be studying. Then I trawl the web and look for lovely links: games to play, printables, experiments to try, worksheets, coloring, museums to explore on-line whatever. Anything that will stretch their reading a bit and teach them other skills as they go. So by the time Monday comes each student has a pile of goodies to look at and pop into their journals. I plan to blog these week by week this year – and why I haven’t bookmarked them previously from year to year I have no idea! Each week they have their journals good to go. Electives are things like art appreciation, music appreciation, general arting and crafting. Exercise, music instruments and other strange life skills like jump starting a car. In this category go the things that they are passionate about. Each kid has they own passion that they pursue regardless of what they learn for school. Literature, electronics, photography, cooking, whatever. I try and put things that might interest them in their paths and then leave them to it. Each week they have their electives good to go. That’s it. Planning in a nutshell. Next week I will talk about our school schedule. I just wanted to let you know that I adore your blog! Always inspirational and encouraging! Thank you so much for sharing! Wow C, So glad you like it! I think you just made my week with your friendly comment! Ditto C! I don’t know how you manage to do all that you do and so well. (Although, to be honest with myself, if I did actually do less procrastinating in a day, I probably could get more accomplished!) I wanted to say that I LOVE this post! Thank you so much for this series coming up. I am so grateful to peek into the home of a seasoned Sonlighter and pick up on some expert advice. I will be bookmarking this post and the ones coming up for sure! Do you mind if I ask some questions from time to time? 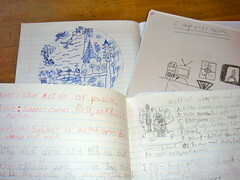 A couple that comes to mind now are: 1) do your kids do handwriting and copywork in their journals too? And spelling / spelling tests? and 2) I know that your kids sometimes listen to their read alouds on ipods etc – but how much reading aloud do you do? and from which cores? … okay so that is more than 2 questions! I’ll stop now! Yes… I wholeheartedly agree! My husband laughs his head off at me when just before bed, if we have been doing other work etc I run for the computer and quickly log on to se7en. He says "what are you doing?…. getting your fix again?" I love this post. Please can you do one on what to do with little ones while doing homeschool with older ones… what toys do they play with during school time is there structure to what they do… etc to keep busy so I can give more time to older child that needs it (and has special needs) Love Tams. Wow! Your pictures look so orderly. Our box day photos would look like a huge pile of books with my kids sprawled everywhere sniffing through them! Thank you for sharing your system. Your organization has inspired me. I’m going to read through it once more. Now I’m itchy for a box day, but we are still in the middle of core 4! Hi Taryn! Gosh it sure is my day!!! Thanks for the great comment… some of your questions I will answer as we go along in the series – so ask away, its great to write with a purpose. 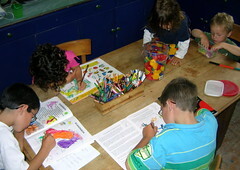 Firstly their handwriting goes into their handwriting workbooks, their copy work goes into their journal. Spelling from language arts goes into their journal. They change over to Spelling Power in Grade 3 (later post). We do masses of read-alouds and I will plot our schedule out this week. I do sometimes get lucky and find a free classic to download – in which case they listen on a shuffle. Like the Wizard of Oz – my kids love it… and I download it (I will post on resources for each subject) because the thought of reading the Wizard of Oz Se7en times just sends me into a tails spin – it’s a personal madness, trust me! Hay Tam, That’s a fabulous comment! I will think about the answer and post this week coming when I do the schedule… I must say the more kids you have the easier it gets… they keep each other entertained! I realize you really need to focus on your big guy when you are schooling and I will put some thought into what I did when my first started school – I know my first required masses of one-on-one time to get through his schooling until I figured out the whole school thing! So hold your horses till Thursday or Friday… Thanks for a great question! Hay S. Oh yes very orderly!!! That’s because our boxes arrive after the kids are in bed and I get a whole night with them before I let my kids near them – I enjoy the moment!!! While I spend the next day recovering and browsing I let them too it! Right now the wait is so killing me!!! But I may stop blogging, when our boxes arrive sometime this week – forgive me but life is too short to miss a box day!!! Thanks so much for sharing these tips and your experience. May they help many people! Great stuff. Hay you… Thanks for visiting again! So much for incognito. I laugh at myself! this post was just awesome. I tried sonlight a few years ago and did not do well-I seem to be schedule-challenged, and yet, with many kids I realize a schedule is the only way I am going to get most of what we need done. I am overwhelmed with the whole planning thing, too…you post was just brilliant, my brain is spinning with all kinds of ideas now. Please post more on how you actually do all this…! Hi J, glad you managed to comment and welcome. I will be posting on our schedule later this week. Hey, se7en, thanks for your great posts, which I come across every once in a while through the craft site "oneprettything.com". Just curious — I have a 19-month-old who passionately loves books (almost to the point of driving us crazy with her constant need for more! ), and I’ll likely homeschool her. At what age(s) have your children begun working with Sonlight? I’ve tutored high-school age children working with Sonlight and was impressed with the curriculum and even more impressed with the high schoolers who had grown up with Sonlight (they were better writers at fourteen and sixteen than the majority of my freshman- and sophomore-level college students), so am considering it for my little one, but am not sure how early she can start. She seems to be unusually bright verbally, and I thought a heavily reading-based curriculum might be right for her. Blessings! Thanks for your great site! Hi SK… My first is also very bright… galloping through shakespeare at 6… I have always thought super bright kids battle so much to stay level with their peers that I have never ever tried to get him ahead – I always try and spread his knowledge wider… So get the beautiful Sonlight books from the pre-pre-K and just read away (if there is one book then read the series!) but don’t bother with workbooks or anything. Spread their knowledge far and wide – they really have lots of time to achieve. Hay Sk, You are most welcome. Ask away I have been there believe me! I stumbled onto your site while looking for reviews on the Sonlight curriculum, I love your site, I can’t stay away from it. As I also live in SA, I was wondering if you could help me out with some questions I have. How long does your Sonlight curriculum take to arrive from when you’ve placed your order? Do you order it straight from Sonlight themselves ? Also do you pay customs/duties on it and if so what percentage do you have to pay? I hope I haven’t bombarded you with too many questions, your help will be very much appreciated. Hi Abs, Okay I will try to answer your questions fully… and I know I am not being terribly helpful, but keep asking if I don’t cover everything. I don’t order directly from Sonlight I have always been able to use an intermediate friend… I use free shipping in the United States and then they bring it over as a personal favor to us. This is cheaper because the shipping does add between 40% and 50% to the price of your books. But it does take ten to twelve weeks to get here by sea, and then we do pay customs/duties and you can not predict that – it seems to depend on who processes your books on the day. Otherwise we have quite a few friends that are prepared to pay the money and order directly, their shipment gets here within the week if not faster, door to door… I am not sure how they pay customs but I know they do, perhaps to the delivery man? Hope this all helps!!! Have a good day!!! I’ve been homeschooling for two years only one with a formal curriculum. Was not completely happy thus went on my search again. This time I found Sonlight. After reading two of their catalogues for nearly a year we’ve finally made our decision. And right now I can’t seem to find any answers regarding duties and taxes. So I guess my question is the same as Abs. Just wanted to say thanks for sharing and all the tips. Bless You. HI Shanaaz, You are right I answered Abs as fully as I could and nothing has changed since then. Sorry I am not much help in this department. But I can say after all our years with Sonlight it really is worth the effort of getting it here. All the best. Hi thanks for the insight in marking up books. I just have one question … do you have a new instructor guide for each child per grade or do you just reuse the original one? I am using mine as a “register” to mark off that the work is done – how do u handle this? Hi Kim… Yes… I do indeed get a new IG for each kid… it is half price if you buy it a subsequent time and so worth it!!! If new books get added into the curriculum then it is so easy to include it!!! And there are slight changes from year to year and I enjoy… Let’s face it I am doing it over and over again!!! I mark mine up as we go and then they are a record of what my kids have done for school. Not everything they do can be put in a file… but I always have the IG to say: This is what my kids have done for school this past year. The science sheets and language arts sheet I keep in their school record and they are really quite fun to look back on!!! Thanks so much! That is what I have started doing (am going to need a library of space!) is good to know it works for your many, too. 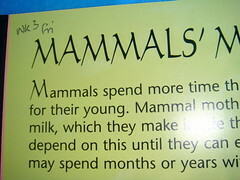 Oh Kim… Every year I say – that’s it… no more school books our house is full and every year we absorb a whole lot more!!! Indeed a library collection needs book shelves, that’s just the way it is!!! We have 7 kiddies, aged 17, 13, 11, 6,4,2,14mo and we’ve just begun with Sonlight. We are doing 3 cores (for the 13yo-CoreAlt7, 11yo-Core3+4 and K for the 6&4yo together). I chose to do 3 cores because I wanted the appropriate levels for each child so I wouldn’t have to tweek and adjust everything, but rather be able to spend more of my time teaching instead of planning. I did realize that most people who do more than one Core find it to be very time consuming. As I’m getting into it, I am realizing that the 4 and 6yo are developmentally quite far apart and I’m rethinking having them in the same Core. So you can imagine my relief to find a lady in SAfrica who has time to blog and do 5 Cores of Sonlight! I would love to know even more details about how you are using Sonlight… you’ve mentioned that you make the dictations into copywork assignments (I DO find the dictations somewhat time consuming for me); you sometimes find audio recordings of some of the read-alouds; you are very organized about marking up your books and having things ready the night before so that your kids can work through their assignments more independently. Are there any other ways that you make Sonlight work a little better for you? Do each of your children do separate memory work and Bible? Do you go through all the comprehension questions that are in the IG Notes? 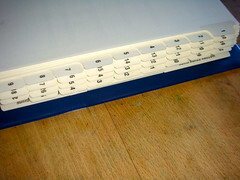 I think you don’t keep Timeline books… any particular reason why not? I am excited about using Sonlight. I love books. I want my children to love books and I hope to make school more enjoyable for them. From everything I see so far about Sonlight, I think it is the perfect fit for me. Now, as I’m getting started with it I just need to figure out ways to make it work with 3 (or more?) Cores. Thank you for your website. Hi Christine… goodness I hope you enjoy Sonlight as much as we do!!! If I was just starting out I would say: Go slow and steady until you are into it… even starting one or two subjects a week until you are comfortable and then adding subject by subject to the mix. Yes they all do their own Bible study and for memory work we play the CD’s in the background… everyone knows everyone else’s!!! We don’t go through every single IG question, they are our guide and at the end of each book we use them for review and for writing book reports… We do do the timeline but individually in their history journals and at the end of the year for review… I am planning to do a history post quite soon so you will have to watch and wait for that!!! Here is a link to all our homeschool posts and you are so welcome to browse around and use whatever you find helpful!!! All the best and hope you have a great day!!! Hi there! Thanks so much for the blog, was so pumped when I found it! I’ve been reading everything on the Sonlight website for hours and then thought, “I really like this but will it work in SA?” I don’t want my kids to tune me in like 12 years from now, Dad, did you know we don’t stay in America? and we need family counseling or something. And I wouldn’t want to put them at odds with the South African government either. Wanna make sure they get the good stuff. And then saw you were using it, that’s quite comforting indeed. Thanks for posting! Hi Martin, You will find that their are tons of South Africans using Sonlight. Where ever you find home schoolers I am sure you will find son lighters as well. It is a great product and we can’t love it enough. All the best with your research. I am starting to prep for sonlight next year and you can’t imagine how many times I’ve read this post to help center myself on how to get ready for this, and I just have one kindergarteners!! Thank you for this post!! Oh Katie, Wonderful… I am so glad that you are finding this post useful!!! I am wishing you all the very best on your homeschool journey – exciting times!!! Just wanted to thank you for these wonderful, helpful posts on your site! I have seven children, five in school this year, a baby and toddler. Because of your posts, I have decided to give Sonlight a try — and box day was every bit as wonderful as you said it would be! I am so nervous that I won’t be able to keep up with it — but I return to your blog again and again for encouragement and inspiration. God bless you!!! Hi Lecia, I am so excited at your box day and your new adventure with Sonlight!!! Here’s a hint: Go at your own pace, whatever works with your kids… then you just have to maintain your own speed and not worry too much about keeping up!!! Wishing you all the best – and feel free to ask any questions that arise… most of our blog posts arise from folk that have asked us questions!!! Have a great week!!! Hi again! I’m absolutely *loving* Sonlight! I was just wondering how you keep their finished worksheets — and also, is their “file” a 3-ring binder? Thanks again for all your amazing, helpful posts! Oh Lecia, that is a great post idea… and you aren’t the first person to ask!!! Just what to do with all the work they have done at the end of the year!!! I do have a storage system in play, and I am going to write a blog post about it – my schedule is filled for the next week or two but look out for a post before the end of the month… thanks so much for asking, our homeschool posts are very much reader driven and I rely on folks asking questions to get new post ideas!!! Hope you have a fab weekend and it is good to hear you are getting on so well!! !